Do You Recognize That There are Two Sides? Posted on June 17, 2010 by Kathy T.
A brief look at the blog posts, the letters to the editors, and the comments that border on juvenile shows a polarized people on almost every subject. What is worse is that when someone tries to admit that both sides have some merit, but they also have failings, they are almost always viewed as being in the ‘other camp. I tend to agree with Gunner on this one. Yes, my political views are very different than those of about half the country BUT I do think it’s important to consider all sides with issues. As distasteful as it may seem to each of us, perhaps spending 30 minutes each week listening to either MSNBC’s Keith Olbermann or Fox News Bill O. (the one you don’t usually watch) may shed light for each of us as to why the other half thinks like they do. I am being careful not to say which side I fall on, but do think both sides have merit just as both (like Gunner said) have shortcomings. Are you willing to compromise or are you so rigid in your opinion that you’re willing to see be a part of our cracking civility to each other? Stay Cool In the Theater! Posted on June 13, 2010 by Kathy T.
When the heat is in the upper 90’s and the humidity is also high, the heat index is just deadly. Try to stay cool if you spend a lot of time outside. Rest frequently, drink plenty of water, stay in the shade whenever possible. Always be aware of where you are, where your kids are, and how hot it is wherever you are. Another way to stay cool is to head to the Malco-Roxy Cinema in Smyrna on certain days … you know how cool theaters are … for inexpensive family days. From our friends at This is Smyrna, here are the shows for the remainder of June and July. 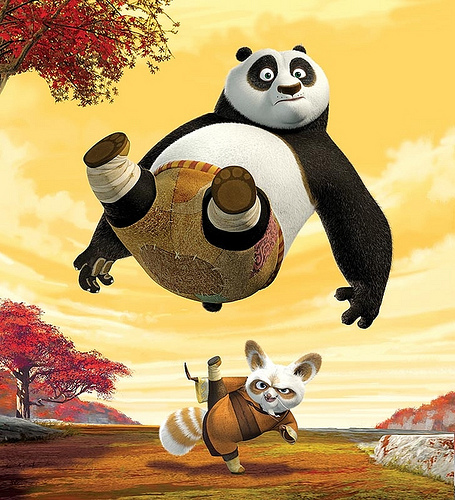 Shows start promptly at 10:00 a.m. and are $2 p/person. Photo from prenylastman via flickr creative commons. 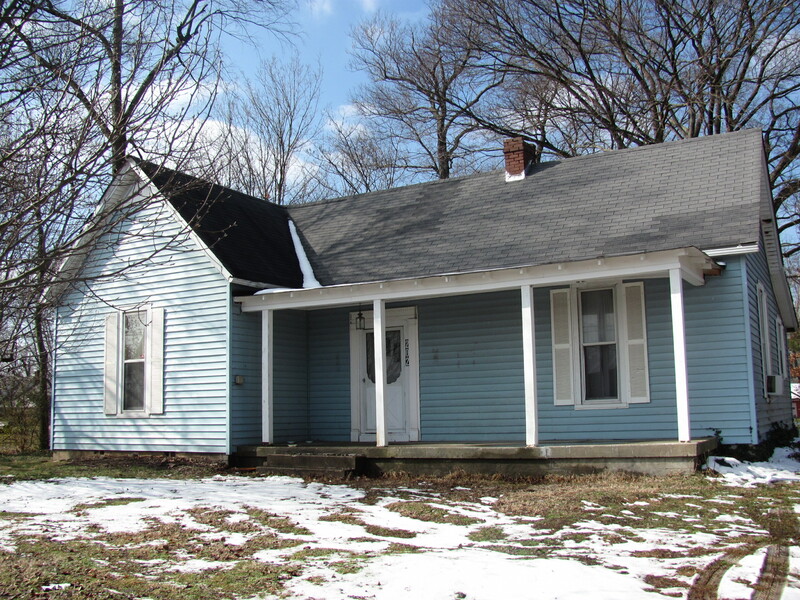 To Flip or Live in Historic House? Posted on February 5, 2010 by Kathy T.
I meant to post this before today, but have been working my fingers to the bone as a concession stand worker raising money for my daughter’s baton expenses … time is fleeting! Before I get to the house, beginner baton classes sponsored by the Tennessee Twirlers start on Tuesday, February 9th at 6:00 p.m. Classes will be held at the community center behind city hall. If you have a daughter (or son too!) who is interested in becoming a twirler, it’s a lot of fun and builds confidence and self-esteem. Call me if you have any questions at 491-2161. 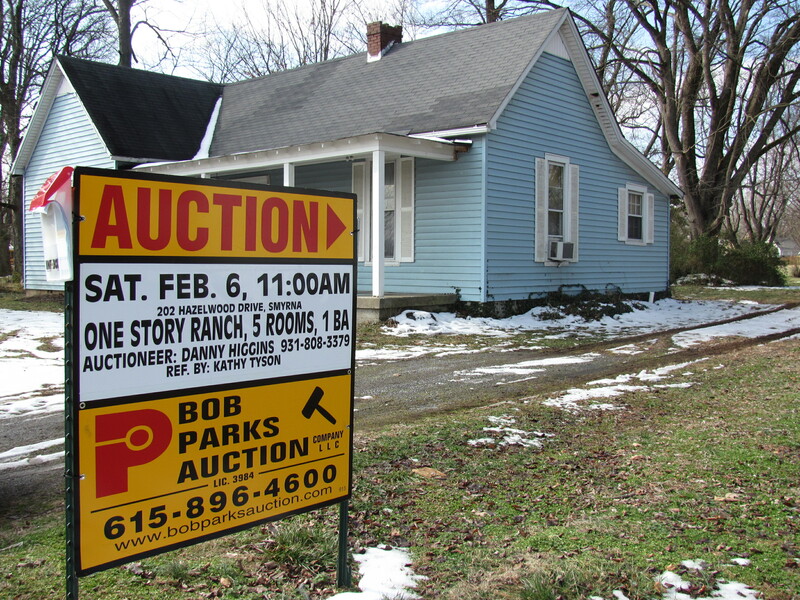 Meanwhile, this house in the historic district of downtown Smyrna will be auctioned tomorrow morning (Saturday, February 6) at 11:00 a.m. Located at 202 Hazelwood Drive, it has two fireplaces, but one is a two-sided for two rooms). It has years of memories and a lot of potential to be an absolute beauty inside. The home was built in the late 1800’s so you know it’s solid, however it does need updating (possibly plumbing, electric). It would be a great project for someone to go in and remodel OR if you want to live in a historic house … to get in inexpensively (but be prepared for a big project). Again, let me know if you have any questions and if you come, find me and say hello! Here’s a link to the official info from the auction site. 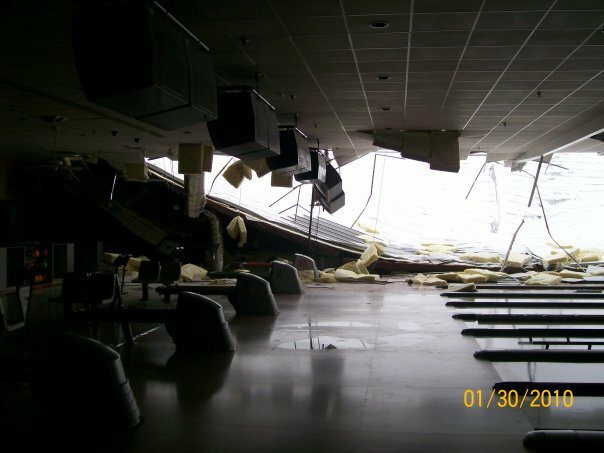 Posted on January 30, 2010 by Kathy T.
UPDATE 1:45 p.m., 1/31/2010: From the DNJ, Roof collapses at Smyrna Bowling Center. Photo posted on Mark’s facebook page, taken by mechanic. 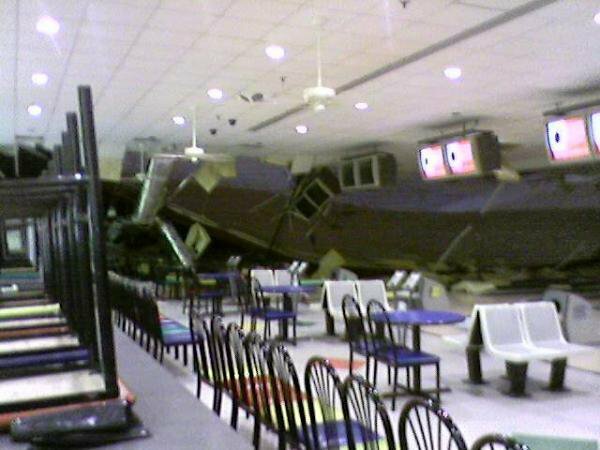 UPDATE 12:09 p.m., 1/31/2010: Become a fan of the Smyrna Bowling Center on Facebook. UPDATE 11:42 a.m., 1/31/2010: From the DNJ, Tournament Postponed. My friend works nights at the Smyrna Bowling Center and how fortunate we have been in this area to have this 24-hour, 7 days a week recreational facility. Bad news is that for what will probably be several months, we’ll have to go somewhere else to bowl morning, noon and night. The owners are of course talking to their insurance company, but until engineers say the building is safe to enter they can’t even get inside. There will probably be extensive water damage where water lines were broken in the collapse causing water to run through and under most of the state-of-the-art wooden lanes. If any of you know of any temporary work for my friends who work at the bowling center, please contact me. Meanwhile, I hope the owners and employees know how sorry we are that this has happened… we wish you godspeed in making the repairs. Posted on September 2, 2009 by Kathy T.
Not to stray too far from the pig conversation, did you hear about the plane crash yesterday? I had spent all day at a friend’s home so was none the wiser until a friend told me there was an airplane crash near my house. Fortunately, only minor injuries were reported. Also fortunate was that my mother-in-law didn’t hear about it until everyone got home because she would’ve panicked. Here’s the story in the Daily News Journal as reported by the always prolific Mealand. Airport officials said Tracy Haun, believed to be in his 30s, was taking his first flight on a replica of a de Haviland Tiger Moth, which debuted in the 1930s. The crash occurred around 1:30 p.m. in a wooded area about a mile north of Runway 32 near the Smyrna/La Vergne border. Glad to hear no one was hurt badly. Posted on July 14, 2009 by Kathy T.
We had a member of the Smyrna City Council speak at our meeting this morning and heard an update on the latest growth news in Smyrna. They do continue to grow, but some of the retail is slowing … to the point where new businesses are still coming but not opening as quickly as before. The biggest growth will be three to four liquor stores coming – the first could open in October or November. When the city’s residents passed the referendum allowing for liquor store sales there were several retailers already poised to move. Stores will be located on Sam Ridley (near Publix and Home Depot), on Weakley Lane at Sam Ridley, and potentially on Lowry Street. In addition, the Penney’s is still planned with a TJ Maxx as a possible co-anchor store, but it may be 2010 before we see these built behind Lowe’s and near LaVergne High School. The other big news is that Jefferson Pike from Sam Ridley Parkway to 840 will be widened to four lanes to help accommodate the expected growth due to the electric car production by Nissan. In addition, while 1300 jobs are officially expected, the Smyrna Council expects more due to ancillary business growth. To prosper, we need to grow. And we need to grow in a responsible way. How about us, LaVergne? In addition to widening Waldron/Parthenon Road … what are we expecting?